If you or your pet have experienced amazing results, please post it on our Facebook page by clicking the image above. As you may remember, many animals were displaced by Hurricane Katrina in September 2005, either from their homes or shelters. Animal rescue groups from around the country traveled to Louisiana to help these animals. While I have volunteered at animal shelters, I had never done "animal rescue" work before and this was my first foray into it. While very rewarding, it is also very stressful, and people who do this all the time (generally as volunteers while holding down paying jobs in other fields) are the unsung heroes of our society. Lorraine May, executive director of the Denver-based Misha May Foundation (named for her dog Misha), decided she was going to go down to Louisiana and bring back animals to Denver, so they could receive medical treatment and find homes. This was a courageous decision on her part because the Misha May Foundation is a very small organization with limited funds that doesn’t even have a facility yet or any paid staff. Everyone is a volunteer, including Lorraine. She runs the Misha May Foundation out of her home in Denver, which is also the headquarters for her holistic dog training business. This gives you some idea of the passionate commitment she has to helping animals. We have known Lorraine for several years--I studied Reiki for Animals and took my Reiki Master/Teacher training with her, we took our dog to her training classes and are members of the Misha May Foundation. So when I heard about her trip to Louisiana, I offered to post information on my website, knowing that Lorraine cannot get her own Foundation website updated quickly. She doesn’t have IT staff (or any staff) and sometimes has to wait weeks for a volunteer to have time to work on her website. Since I am also an IT professional, I do the Optimum Choices website and can easily update it. Lorraine drove down with 5 other volunteers to Louisiana on Saturday, September 17, 2005 with 3 donated horse trailers. On Sunday afternoon, they loaded up the trailers with approximately 50 dogs and cats, plus 2 rats from a shelter at a farmer’s market. Due to the brutal heat in Louisiana (100 degrees), they had to wait until evening to drive, or the animals would perish in the non-air conditioned trailers. They waited until 7 pm Sunday night to leave and drove straight through the night and all day Monday, reaching Denver around 8 pm Monday night. The media had been alerted to their mission but unfortunately Lorraine and the trailers didn’t arrive at 5 pm when expected, due to the delay in leaving Louisiana. So the media, which had been camped out at her house to film the drama of the animals arriving, were all gone when the animals finally arrived. Lorraine’s trailer was first to arrive and she stepped out of the truck with a small pitiful looking dog cradled in her arms. She choked up with tears as she introduced the dog: "This is Katrina" and everyone had tears in their eyes at the sight of the little dog. More volunteers than dogs swarmed around the trailer to welcome the dogs and walk them. Since I wasn’t needed there, I wandered over to the garage where the cats and rats had been unloaded (they came in on the second trailer). The rats were in a cage with an empty water bottle lying on top, so I filled it and gave them a drink, since no one was paying attention to them. But don't feel sorry for them--they were the first animals adopted and went home to their new home that night. Eva, the main cat volunteer, had been busy scrubbing and assembling cat cages before the animals arrived. The cats were now safely stowed in their clean cages in the garage but there was a rank scent in the garage from their filthy fur--one cat was so dirty that its fur looked wet. Who knows what that cat went through before it was rescued? Still, that cat was extremely friendly, rubbing against the bars of its cage, asking for petting. When the third trailer arrived later, there were fewer volunteers available so I helped unload dogs and took a dachshund mix to walk. By now there was "controlled chaos" in Lorraine’s backyard. People were milling around with dogs, waiting for the vet and her vet techs to examine and vaccinate each dog. Kris Ahlgrim, DVM, of GoldenView Veterinary Hospital, had volunteered to examine, test and vaccinate the animals brought back by Lorraine. She arrived with her army of vet techs Monday evening and worked for several hours to process all the dogs. There wasn't time to do the cats as well that night. As the dogs finished being examined, they were then stowed in crates in the backyard to spend the night. It was a bit of an adventure simply to find a clean crate of the appropriate size for each dog from the stack of donated crates out on the driveway, some of them disassembled. The next day, all the animals were groomed at An Average Pooch Pet Spa in nearby Englewood, where one of the Misha May Foundation board members works. Many of the dogs went to foster or adoptive homes. The dachshund I had been walking was adopted by a man who agreed to take it even though it was infected with heartworm (fortunately only 2 dogs were so infected). Lorraine had asked for "cat people" to come Tuesday night so I arrived then with my friend Fredda, a cat lover, to cuddle cats and do whatever was needed. Kris Ahlgrim arrived again, after a long day's work, with her army of vet techs to examine and vaccinate the cats. The cats had now been bathed and the friendly cat with the filthy fur from the night before turned out to be a beautiful, classically-marked tabby cat named Boone. Lorraine was still busy dealing with dogs in her yard so I handed each cat to the vet for examination. 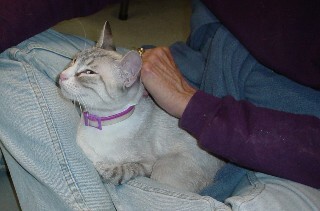 After a beautiful but shy Siamese-mix was examined, I handed her to my friend for some lap time. This cat, renamed "Gypsy" by Fredda, turned out to be a very sweet, affectionate lap cat--she spent a couple of hours on my friend's lap and dug her claws in, protesting, when I tried to dislodge her to return her to her cage. All the cats were surprising sweet and affectionate, given what they had gone through. Two of them went home that night to foster homes, including Destiny, a sweet little cat with a broken leg who had been a stray alley cat in Louisiana. I photographed all the cats so I could post their pictures on the Optimum Choices website to help get them adopted out. The next day the cats were transferred to cages at An Average Pooch Pet Spa, a more suitable location than Lorraine's garage, though not open enough hours for potential adopters to easily visit them. Later, one of the cat fosters was able to arrange donated kenneling for them at Wheat Ridge Animal Hospital (WRAH), a 24-hour emergency veterinary hospital. Two of them had been sick with diarrhea since arriving here and needed medical care. Since I had an appointment near where the cats were housed, I offered to transfer them to Wheat Ridge. Originally I had not planned to help care for and adopt out animals but by now I’d become attached to these cats. I transferred 7 cats there Friday, leaving 2 to go to an adoptathon Saturday. On Saturday, the 2 went to the adoptathon, along with the 3 kittens. Unfortunately, Saturday was the day everyone started getting sick. Many animals coming from the hurricane area were in poor health after what they went through and these cats were no exception. The 2 cats at the adoptathon starting sniffling, so they were immediately taken to WRAH for treatment while the 3 kittens went home with their foster mom. In cats, sniffling doesn’t just mean a little cold like it does with humans. When cats get an upper respiratory infection (URI), it can be very severe and quite contagious. The cats are normally put into isolation and given antibiotics to prevent pneumonia from developing. Stress and frightening experiences like what these cats went through can help trigger the development of URI. 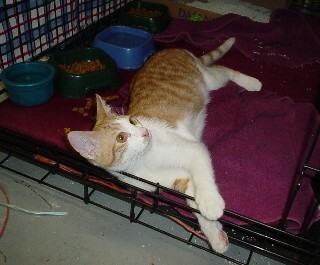 By the next week, WRAH had 5 of our 9 adult cats in isolation, with URI. That week, the foster mom also called us in a panic because one of the kittens was sick and sniffling. We couldn’t burden WRAH further with the kitten so Eva found another place, CARE Animal Hospital in Arvada, that offered us low-cost care for it and all three kittens were taken there. On Wednesday, WRAH contacted us because caring for 5 sick cats in isolation was over taxing their resources and asked us to move the cats in the next couple of days. Though this may sound like a cruel decision, one has to realize that vet hospitals don’t have the resources to deal with a disaster the magnitude of Katrina. Human hospitals at least can get government funding if they are public or they have insurance reimbursements. But veterinary hospitals can’t afford many charity cases. So, we began calling other hospitals as well as the Colorado Veterinary Medical Association (CVMA), which had been receiving donations from people for care of Katrina animals. I also sent out a desperate e-mail plea to the Rocky Mountain Holistic Veterinary Medical Association (which I am a member of), asking for help finding a place to care for these sick cats. It turned out that the CVMA did not have a process in place to help small organizations like Misha May. They were set up to work with larger organizations such as the Denver Dumb Friends League and Colorado Humane Society that have facilities. Their best option for us at the time was to surrender our sick cats to the Colorado Humane Society, who would then care for them and own them. This option was not palatable to Lorraine May, who preferred to keep the animals within her own organization, so she could ensure they received good medical care and were adopted out to loving homes, rather than euthanized to make room for healthier animals. It’s an unfortunate fact that many shelters have to euthanize animals to make room for new ones coming in. Any shelter or organization that doesn't "euthanize for space", as it is called, must turn away animals instead. So while a so-called "no kill" shelter may not kill animals directly, they will be forced to turn away animals that then go to "open admission" shelters where they must kill animals to make room for more. Such are the facts in a society where millions of unwanted dogs and cats are born every year. The CVMA told us they could not provide us with any funds immediately for medical care but we could apply for funds later and if any were "left over", we could receive assistance. This was somewhat aggravating because every person in the Denver metro area who wanted to help local Katrina animals was being told by vets and organizations to donate their money to the CVMA. Yet we could not access those funds even though we were rescuing Katrina animals. Meanwhile, we had sick cats needing immediate care. So, we continued calling veterinary hospitals to see if anyone could donate care. Eva saved the day by obtaining an offer from her veterinarian, Julie Kelly at Aspenwood Animal Hospital in Denver, to take 4 cats. It was time to start driving cats around again--I went to WRAH and loaded up the 4 sickest cats, to take them to their new hospital home. This time, there was a symphony of sneezing and howling in the back seat of my car from the sick crew. Fortunately cat #5, Boone, the beautiful tabby, had come out of isolation and was back in the kennel at WRAH. Then medical crisis #2 hit. The sick kitten at CARE Animal Hospital was worse and needed to be put in an oxygen chamber, which they did not have at their facility. WRAH could not afford to donate care for it but they had an available oxygen chamber so I drove up to CARE, picked up the kitten and transported it to WRAH for treatment. Animal Hospital Center, a 24-hour emergency hospital in Highlands Ranch, had called back earlier in the day, offering to donate care for one of the cats in isolation (Boone, who no longer needed treatment). I now called them to see if they could provide oxygen for a sick kitten instead. They agreed and I scheduled to take the kitten there the next morning. Meanwhile, the CVMA had called Lorraine and said they would be setting up a process in the future whereby private vets could apply to them for reimbursement for care provided to Katrina animals--good news for us! The next morning, the little kitten was loaded up again in my car, for the long trip to Highlands Ranch from Wheat Ridge. Though sneezing, it seemed much better. We drove through rush hour traffic there and when we were 5 minutes away, a vet called to say their oxygen chamber was in use and could I bring the "other cat". I explained that the other cat was well and asked if I could bring the kitten anyway and maybe it wouldn’t need oxygen, just isolation. They said "yes, but if it gets worse and needs oxygen, we’ll have to euthanize it so it doesn’t suffer". Egads! I called WRAH to find out more about the kitten's treatment and was told that the kitten had not been on oxygen overnight. Whew! So I continued to the Highlands Ranch hospital and the kitten was accepted there for treatment in their isolation ward. I left instructions that if it needed oxygen, they were to call me and I would try to transfer it to another hospital. The next day I called and the kitten was doing well--another crisis averted. Later that Friday, I received a call from Alameda East Veterinary Hospital (the 24-hour vet hospital featured on Animal Planet) and they offered to take one of our cats. Apparently they had a process worked out already with CVMA to provide treatment for Katrina animals and were treating a Katrina dog for pneumonia. I said "thanks, but I have the sick cats placed now in hospitals". By now, poor Eva was so stressed out from dealing with providing for the medical and housing needs of all these cats, while working a demanding full-time job, that she had to take a break from working with the cats. I was also stressed out but more able to cope with it because my computer job was part-time, while I did our own business, Optimum Choices, the remainder of the time. So at least I was in less danger of being fired than Eva. I had no idea that animal rescue work took so much time until I plunged into it with these cats. Monday I was driving to work, thinking everything was taken care of when the new foster mom for the kittens called to report that one of the 2 remaining kittens was sick. It was sniffling, breathing through its mouth and lethargic. Thank goodness for all my calls to hospitals last week--I had an ace up my sleeve this time. I called Alameda East Hospital and they agreed to take the kitten for treatment. It turned out this kitten was less ill than the first--they gave it antibiotics and sent it back home. 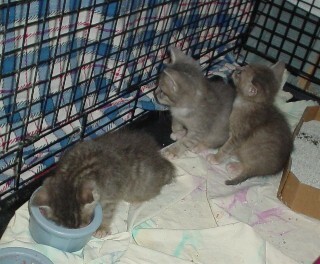 Then a couple of days later, the third kitten also became sick and like the second was given antibiotics and sent home. We now had some holistic help for our cats: Susan Crawford, a talented chiropractor who works with animals (doing energy work, cranial sacral and chiropractic) had called on Friday offering to work on our sick cats as well as making a substantial donation of money to the Misha May Foundation for medical expenses. I assume she had heard about our needs from my e-mail plea to the vet association. Her offer was a welcome change from calling vet hospitals and hearing "no, we don’t have an isolation ward" or "no, we have no room in our isolation ward". Although I do Reiki energy work on animals, I was so busy ferrying around cats and calling vet hospitals, as well as dealing with potential adopters and foster homes, that I couldn’t do much more than provide the vet hospitals with our holistic algae product, BioPreparation (donated by Optimum Choices and BioAge), and hope they might use it to help the sick cats get better. On Monday, Susan reported that she had worked on the 4 cats at Aspenwood and made plans to see the sick kitten as well. Additionally, she agreed to pick up the homeopathic remedies recommended by my vet (classical homeopathic vet Jan Facinelli) and provide it for the cats. Also, she contacted Donna Starita, a vet in Oregon who specializes in long-distance work and enlisted her help in treating our cats. It can take weeks for cats to recover from URI, even with the best of medical care, so the addition of these holistic therapies was most welcome. The Misha May Foundation has always sought to integrate holistic and traditional medical treatments in caring for its animals. Dr. Facinelli later explained that the homeopathic remedies aconite and arnica are indicated for all animals rescued in this fashion. Giving them a dose as they arrive in Denver could help prevent them from getting sick later, especially with the added stress of vaccinations upon arrival. By mid-October, the 4 cats at Aspenwood finally recovered enough to move into adoptive or foster homes. It took us until the end of October to find foster homes for all of them. By mid-November, we found adoptive homes for all the adult cats. It took us until mid-December to place the last 2 remaining kittens. Like many Katrina animals, they had parasites and that discouraged potential adopters from considering them. As it turned out, the foster parents fell in love with them and ended up keeping them, giving them a full household of 4 cats. You might ask, why would Lorraine May take on such a huge task, of bringing all these animals back, when she doesn’t have a facility and she didn’t have all the funds, volunteers and medical care in place beforehand. Why not let some larger organization handle this instead? Well, the alternative was to let the animals stay down in Louisiana and die. All you have to do is look at the e-mails that were sent out by animal shelter and rescue workers in the Katrina area to understand why Lorraine was impelled into action. As an example, on October 3 I received a forwarded e-mail requesting ground transport for 80 dogs and 50 cats in southeastern Louisiana that would be euthanized if not moved out immediately. Their scheduled air transport failed to take place so now they were stuck where they were. As of November, there were still animals needing help in Louisiana. Rescue workers down there told tales of starving dogs forming packs and killing stray cats to survive. While the conditions Lorraine could provide (non air conditioned horse trailers and doing animal triage upon arrival in her backyard) were not ideal for these animals, the alternative was to let them die in Louisiana. There simply wasn't time to get the perfect facilities in place if these animals were to be saved. Lorraine also thought it would be easier to obtain medical help through the CVMA, not realizing that they were not prepared to work with small organizations like Misha May. Lorraine went down to Louisiana in early October on a second trip to bring back more animals. This time she rented air conditioned cargo vans and housed the animals the first week at a storage facility next to Alameda East Veterinary Hospital, who donated medical care for several of the dogs. Between the two trips, Lorraine saved a total of 80 Katrina dogs and cats, an impressive number for the small, all-volunteer Misha May Foundation. The Katrina disaster was of such a magnitude, such an unprecedented scale, that all sizes of organizations were needed to pitch in, to cope with all these animals. Saying "oh, I'll just let the large animal organizations do it, like Denver Dumb Friends League" is condemning animals to death. Just as there were huge numbers of displaced humans needing help, needing jobs and needing homes, there were huge numbers of displaced animals needing medical care and homes. As we saw down in Louisiana and Mississippi immediately after Katrina, our infrastructure is not set up to deal with this kind of catastrophe and the same thing is true nationwide—it is not easy for the cities around the country, Denver included, to provide the resources that are needed to handle this influx of displaced people and animals. By mid-October, the media had moved on to other stories, even though the Katrina needs had not gone away. Instead of front page stories about Katrina victims, the front page featured stories in the local paper on things like Creationists giving children a tour of the Museum of Natural History with a biblical interpretation. While that is interesting, I find it hard to understand how that merits more attention than the needs of Katrina victims. I assume the news media feels they must move on to other stories. Meanwhile, the Misha May Foundation still had dogs that need homes, as of Christmastime. Hurricane Katrina is a distant memory now but the need for adoptive homes for dogs and cats never ends. 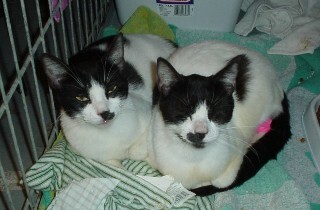 In July 2006, one of the Katrina cats rescued by the Misha May Foundation, Sparkle (picture at right) lost his Denver home. His new owner's living situation changed and she had to surrender Sparkle (renamed Cajun), plus her other cat, Asher, to the Misha May Foundation. They went into one foster home and then were transferred to another. Meanwhile, I posted Cajun on our Optimum Choices website, highlighted them in our monthly e-newsletters every month and distributed posters all over town. I also publicized Cajun's plight whenever we did an animal event. Unfortunately, with Hurricane Katrina being old news and having no facility where the cats could be exhibited (such as an animal shelter), no one was interested in them. Finally I posted Cajun on Craig's list but the only response was someone wanting to know "what was wrong" with him that he hadn't been adopted yet. Well, the only thing wrong with Cajun or Asher was that they were adult cats rather than cute kittens, and there is always a surplus of adult cats up for adoption. In August 2007, our elderly cat (23 years old) finally passed away from kidney failure. We had not wanted to bring in any more cats while she was alive as it would be too stressful at such an advanced age. But now we could adopt more cats and after more than a year of fruitless searching for a home for Cajun & Asher, we adopted them ourselves. We had wanted to get a pair of sibling cats that would be guaranteed to get along but sometimes one ends up with the animals that most need a home rather than the ideal in one's head. Cajun & Asher (whom we renamed "Iris") were purported to be buddies but it turned out that Iris wanted little to do with Cajun and she would fight every time he tried to play. Being a young, playful orange kitty, we felt he needed a buddy. 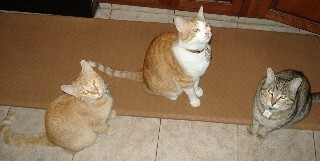 So, after they were fully settled in our home (which took about a year because they were traumatized from so many changes of home), we adopted an 8-month old orange cat in November 2008 to be a playmate for Cajun. 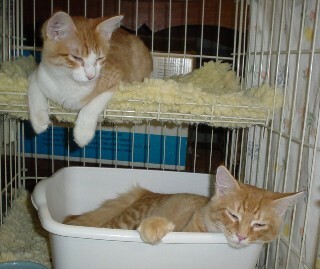 That cat, Simba, came from the Cat Care Society shelter where Margaret volunteers as an adoption assistant. Cajun is happy to have a playmate now but with the difference in their ages (Cajun will be 4 in March 2009), he often gets overwhelmed by the boisterous youngster and fights instead of playing. We hope Simba will mellow out as he ages and make a better companion for Cajun then. 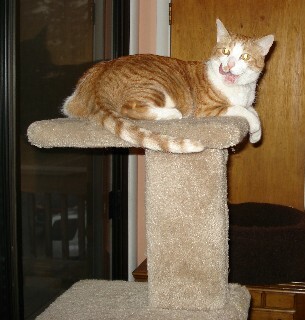 Simba is a typical "wild and crazy" orange cat. If anyone would like to donate money for ongoing (and unexpected) medical care or carriers for animals, be a foster parent or adopt an animal, you can contact The Misha May Foundation. Information on adoption, including pictures of the animals available for adoption, is located here: Adoptions. Nothing on this website has been evaluated by the FDA. This information is not intended to diagnose, treat, cure or prevent any disease. Please see a qualified healthcare practitioner for any disease or illness.